Filmmaker Pablo Larraín’s international reputation rests on a decade-long run of films prodding at the bugaboos haunting the collective historical imagination of his native Chile. Despite a proclivity for some formal unorthodoxies—shooting on vintage videotape in order to evoke the milieu of late 1980s television in No (2012), for example—Larraín has made character-based narrative films geared toward emotional as well as intellectual engagement, and so is better poised than most to cross over from the “international art house” ghetto to a broader audience. Though Larraín sometimes fails entirely to convince on that emotional level—once his films, however bravura, are over, they have a disturbing tendency to fade rapidly from memory—his talent and intelligence have never really been in question. And then there was Jackie. 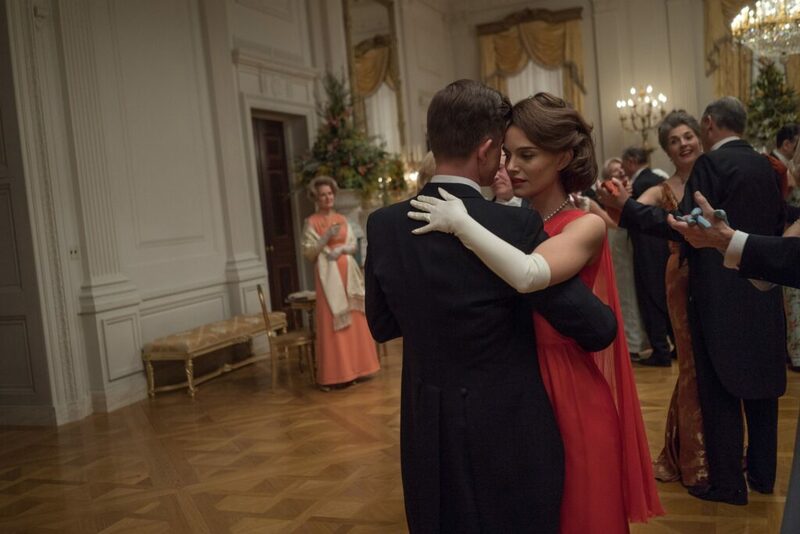 Jackie is a fractured biopic snapshot of First Lady Jacqueline Kennedy in bereavement after the assassination of JFK, featuring Natalie Portman in the title role. It is a laborious ordeal of unceasing histrionic assault and gymnastic hysterics, in its way a feminine counterpart to the monotonous masculine trudge of The Revenant, though Jackie has the decency at least to be brief. The movie opens with Life magazine reporter Theodore H. White (Billy Crudup) paying a call on the widow Kennedy in Hyannis Port, where he finds her defiant, combative, and determined to set the record straight on the meaning of her late husband’s legacy. We return periodically to their interview, while under the direction of Jackie’s narration we are shuttled between points in the thousand days of the Kennedy presidency; the events of November 22, 1963; and Jackie’s planning for her husband’s funeral march and interment. The word “direction” is key, for as the film presents it, Jackie is the curatorial and creative force responsible for our collective idea of what the Kennedy administration was, even feeding White the catchy, nostalgia-laden phrase “Camelot” as a shorthand to refer to the shining ideals and squandered potential of her husband’s unnaturally abbreviated presidency. Jackie punctiliously informs her interlocutor as to which of her recollections will and will not be allowed to see print (“You understand that I will be editing this conversation just in case I don’t say exactly what I mean,” she announces), putting the kibosh on any reference to whistling bullets and splattered brains, while leaving in the glamorous entertainments in the East Room. Prior to the funeral it’s the White House that is Jackie’s principal outlet for her energies, and the film repeatedly revisits the taping of an hour-long CBS News special, A Tour of the White House with Mrs. John F. Kennedy, designed as a sort of public accounting for her extravagant spending in redecorating 1600 Pennsylvania Avenue. These scenes switch between the high-grain color Super 16 in which most of the film is shot, when showing the “backstage” action of television cameras in motion and the off-camera coaching of White House Social Secretary Nancy Tuckerman (Greta Gerwig), and low-resolution black-and-white vintage video to show the mediated image of the First Lady being broadcast into living rooms around the country. To read the rest of Nick Pinkerton’s Reverse Shot review, click here.